I've been saving this post for a while but seeing as we fly to New York very soon for our honeymoon food extravaganza I thought I should put it up now. The weekend after our Spanish beer feast for the world cup beer sweepstake, Claire made the excellent suggestion that we should review some supermarket ciders the following weekend. So we popped into our local supermarket during the week and ended up with six different ciders from a number of different brewers and suppliers. 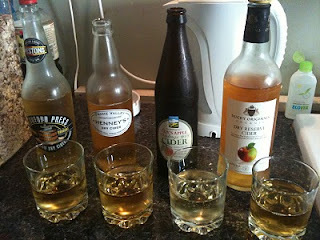 We sampled each of the ciders in turn and then sat down for dinner and finished some of the better ciders with the food. Ciders were scored out of 10. We finished off some of the ciders with a plate of charcuterie, followed by some pork kebabs with a potato and radish salad with a lemon and caper dressing. 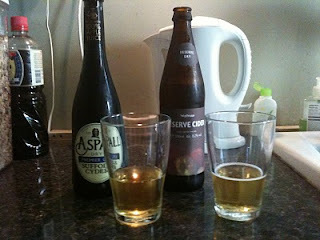 The drier ciders went very well with the charcuterie and I think it's a match I will use again. I have to admit that after finishing off the strong ciders I forgot to take any pictures of the food. Which I will try to make up for with our upcoming meals in the US. Stay tuned for our American adventure!